A ransomware virus dubbed NullByte was reported by malware researchers to append the _nullbyte file extension to the files which it encrypts with a strong AES cipher. The name nullbyte originates from the NUL character in ASCII control code, suggesting that an experienced coder may be behind the virus. Further reports indicate the NullByte Ransomware has something to do with two other ransomware variants – DetoxCrypto and Serpico ransomware. The NullByte virus also demands a ransom payoff from the victims of the computers it infects in the size of 0.1 BTC which is approximately 60 US dollars. 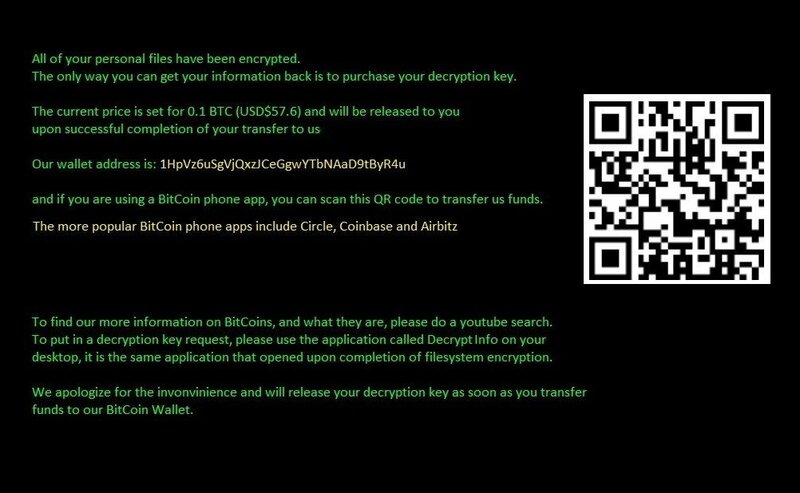 Short Description The ransomware uses AES cipher with an asymmetric algorithm to have a decryption key different than the encryption one. Symptoms The ransomware will lock all your files with _nullbyte file extension appended to them and put a ransom note in your PC as well as lock it’s screen. The note states that you have to pay the equivalent of 60$ in Bitcoins for decryption. The NullByte ransomware virus may use malvertising campaigns to distribute malicious URLs that may cause an infection when they are visited. Sometimes, potentially unwanted programs that are ad-supported (adware) may also be used to display browser redirects to such URL’s causing direct infection on user PCs. Furthermore, the NullByte virus may also be dropped on the computer via other malware that may currently be residing on it. Files that are associated with widely used programs, like Adobe Photoshop, Adobe Reader, Microsoft Office programs, etc. Database and web server files. As soon as it’s pre-programmed list of file extensions has been put to work, the NullByte ransomware virus begins to encrypt the files. For encryption, it uses the Advanced Encryption Standard. This type of encryption algorithm is believed to be used. After the files have been encoded, the virus then generates a unique decryption key which is then sent to the cyber criminals, by establishing an active connection to their servers. The _nullbyte file extension in difference to other expansions is indicated with a “_” symbol instead of “.” which is very distinctive for the _nullbyte virus. → “All of your personal files have been encrypted. The only way you can get your information back is to purchase your decryption key. and if you are using a BitCoin phone app, you can scan this QR code to transfer us funds. To find our more information on BitCoins, and what they are, please do a youtube search. To put in a decryption key request, please use the application called Decrypt Info on your desktop, it is the same application that opened upon completion of filesystem encryption. 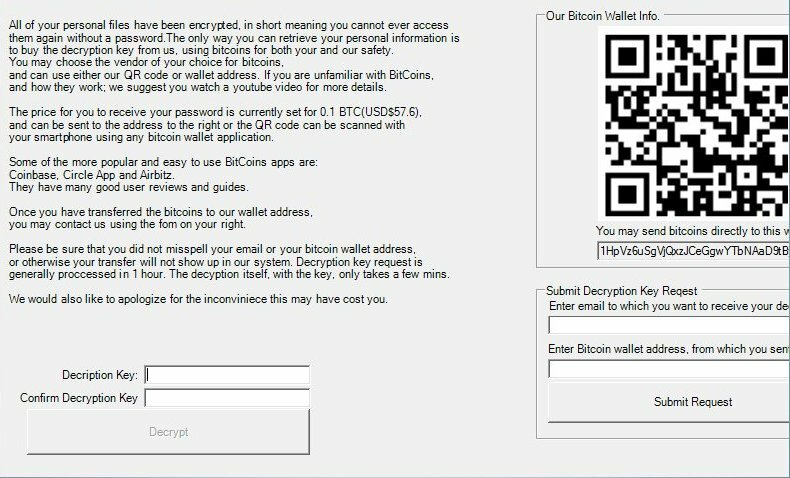 In addition to this, the NullByte virus also displays a lock-screen with the same message and interface that allows users to enter decryption keys that are sent to them after they have paid the ransom of 0.1 BTC. Since this virus originates from two other ransomware viruses – DetoxCrypto and Serpico, it is believed they use the same encryption technique and are developed by the same team. 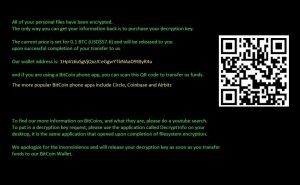 Malware researchers strongly advise against paying any ransom money because specialists may reverse-engineer the NullByte ransomware and come up with a decryptor. Instead, it is strongly advisable to remove this virus using the removal instructions after this article. Not only this, but it is also advisable to use an advanced anti-malware tool to automatically locate all the files associated with Nullbyte ransomware and delete them and detect other malware as well If there is such on your computer. In addition to this, it is also highly advisable to make sure and try the alternative file restoration methods that are posted after this article in step “3. Restore Files Encrypted by NullByte Ransomware” below. Threats such as NullByte may be persistent. They tend to re-appear if not fully deleted. A malware removal tool like Combo Cleaner will help you to remove malicious programs, saving you the time and the struggle of tracking down numerous malicious files. Threats such as NullByte may be persistent on your system. They tend to re-appear if not fully deleted. A malware removal tool like SpyHunter will help you to remove malicious programs, saving you the time and the struggle of tracking down numerous malicious files. Note! Your computer system may be affected by NullByte and other threats. SpyHunter is a powerful malware removal tool designed to help users with in-depth system security analysis, detection and removal of threats such as NullByte. 1. Install SpyHunter to scan for NullByte and remove them. 2. Scan with SpyHunter, Detect and Remove NullByte. Ransomware infections and NullByte aim to encrypt your files using an encryption algorithm which may be very difficult to decrypt. This is why we have suggested several alternative methods that may help you go around direct decryption and try to restore your files. Bear in mind that these methods may not be 100% effective but may also help you a little or a lot in different situations. Note! Your computer system may be affected by NullByte or other threats. Remove NullByte by cleaning your Browser and Registry. Fix registry entries created by NullByte on your PC. Combo Cleaner is a powerful malware removal tool designed to help users with in-depth system security analysis, detection and removal of threats such as NullByte. Step 5: In the Applications menu, look for any suspicious app or an app with a name, similar or identical to NullByte. If you find it, right-click on the app and select “Move to Trash”. Step 6: Select Accounts, after which click on the Login Items preference. Your Mac will then show you a list of items that start automatically when you log in. Look for any suspicious apps identical or similar to NullByte. Check the app you want to stop from running automatically and then select on the Minus (“–“) icon to hide it. Remove NullByte – related extensions from your Mac’s browsers. A pop-up window will appear asking for confirmation to uninstall the extension. Select ‘Uninstall’ again, and the NullByte will be removed. When you are facing problems on your Mac as a result of unwanted scripts and programs such as NullByte, the recommended way of eliminating the threat is by using an anti-malware program. Combo Cleaner offers advanced security features along with other modules that will improve your Mac’s security and protect it in the future. Hey !, I found this information for you: "NullByte Virus Remove and Restore _nullbyte Files". Here is the website link: https://sensorstechforum.com/nullbyte-virus-remove-restore-_nullbyte-files/. Thank you.